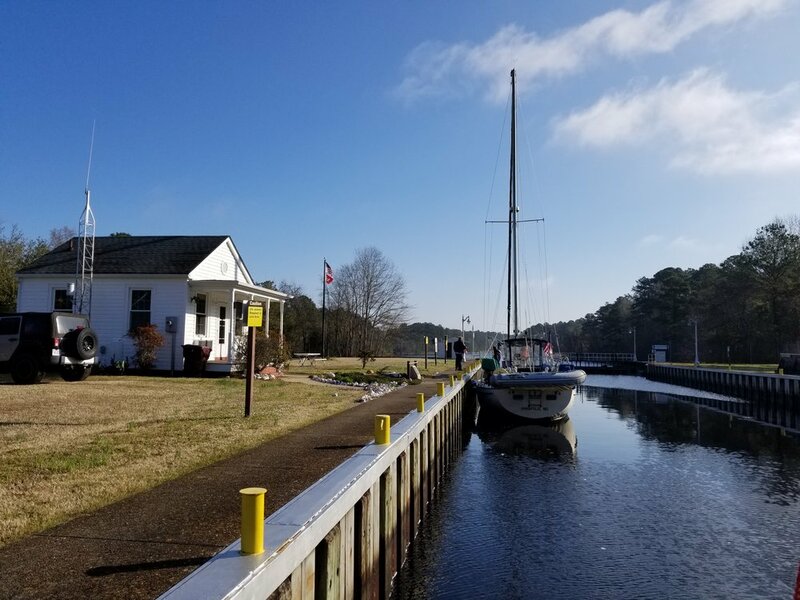 4/3 Wednesday, Downtown Hampton Public Pier, 1308.8, 60’s/48, partly cloudy, W10 - We slept well last evening - our blankets and sleeping bags kept us plenty warm. It was still chilly first thing in the morning, but as soon as the sun was up, it was shining and warming the boat. We passed through Deep Creek Lock at 8:30am. Dobbs motored us through Portsmouth. There was more activity than we’d ever experienced before. An extensive marine construction crew was working on the high bascule bridge at the junction of the Dismal Swamp and C&A Canals. The #7 Norfolk & Southern Railroad Bridge (alongside the Gilmerton highway lift bridge) had trains crossing every twenty minutes or so. The Belt Line RR lift bridge closed several times in the hour it took us to get to it, and it was closed as we approached. We waited perhaps 15 minutes for the train to move clear. By comparison, Norfolk harbor was quiet - only a handful of lone tugs and a couple moving barges. We set sail at Red #14 - first reef main and full jib - and sailed out onto Hampton Roads. I shook out the reef in the main and the breeze continued to fade until we were barely wafting approaching Hampton. We could see the Chesapeake Bay shimmering seafoam green out beyond Old Point Comfort - a beautiful sight after being away for 5 months. We started the engine and motored in. A stop at Bluewater was on the docket, for diesel, water, and ice. Once we had our supplies, we proceeded upstream to the Downtown Hampton Public Piers and were assigned slip #6. Docking is usually challenging here and we ended up warping in. I checked us in and then started a load of laundry. We’d arrived early enough that we also had time and energy for some maintenance - checking fluids, tightening down that loose engine mount nut AGAIN, this time with the biggest wrench on board, and clearing the paddle wheel for the speed gauge. It’s been stuck and reading “0.0” since Hilton Head, but we’ve had just too many long days, or cold days, or long cold days to bother with it. Murphy and I walked over to the dog park and I admired the cherry trees in bloom (the bees were, too) while Murphy sniffed out the “Who’s Who” of Hampton’s canines. At 4:30pm, we returned to Grace to collect the laundry and have Happy Hour in the cockpit. Around 5:30pm, we headed for the showers in preparation for a dinner date at Musasi, our favorite restaurant for sushi (in 1500 miles of coastline.) We started out with a shared plate of steamed gyoza (meat and vegetable dumplings). Then, we each sipped a bowl of miso soup before wading into a variety of rolls and seaweed salad. We split fried red bean ice cream for dessert. As we walked home arm-in-arm to Grace, the night air was taking on a chill. We grabbed jackets and took Murphy for a walk, over to the carousel and Langley Museum, where the trees in the park are decked out with pretty lights. A young couple was having photos taken, a sweet reminder of how fortunate Dobbs and I are to have found each other.